Finance Minister Arun Jaitely presented the last full budget of the Modi-led NDA government at centre on February 1, 2018. Considering the impending elections and the prospects of facing the elections next year (possibly earlier as some speculate), one thought the Budget will try to do justice to the promises the BJP made to the people in 2014 elections, particularly to farmers, about Ganga and other rivers. Modi has just returned from Davos where he said climate change is one of the biggest challenges of future, so one expected that the budget will also have something on environment and climate change. Even the Economic Survey 2017 put out on January 29, 2018 was focused on climate change impact on farmers. Considering the Rural distress that got reflected in Gujarat election results in Dec 2017, one expected credible and substantial better deal for villages and agriculture. Unfortunately, we are mostly disappointed in all these aspects. The speech was full of a lot of politically correct statements, but lacked substance to inspire confidence. The track record of the government has been so poor that such empty words are not going to help convince anyone. Let us look at some key aspects. It’s well known that this govt is focused on improving the EASE of doing business, but has done little by way or ease of living for the farmers, common rural or urban people. So the FM, in very beginning of the speech said: “Now, our Government has taken Ease of Doing business further by stress on ‘Ease of Leaving’ for the common men of this country, especially for those belonging to poor & middle class of the society.” Providentially, LIVING was mis-spelt as LEAVING, or is the govt interested in helping “the common men of this country” LEAVE (the world) more easily? More geoundwater use rather than regulation and augmentation? This norms of districts where less than 30% of the land holdings get assured irrigation presently can be very misleading. For example, in Maharashtra, a state with by far the highest number of large dams in the country, has less than 20% of cropped land under irrigation. So most districts of this state may come under this norm, even though they may already be over exploiting groundwater. Now this scheme can be used to further increase groundwater exploitation. While the budget does not have anything more substantial about irrigation, it's noteworthy that the Economic Survey 2017 released on Jan 29, 2018 makes use of a rather strange ratio of Net Irrigated Area over gross cropped area to compare state (see figure 6 on page 109 in Volume II, Chapter 6). This is a patently misleading and wrong parameter to use. So even though Haryana is better off than UP in terms of irrigation in all seasons, it seems, going by this parameter, to be performing worse than UP, since UP possibly has less area under double or multiple cropping. This is because, for Haryana, since there is more area under multiple cropping, the denominator becomes high, bringing down the ratio. One has never seen use of this parameter and it's a mystery why this has been used. 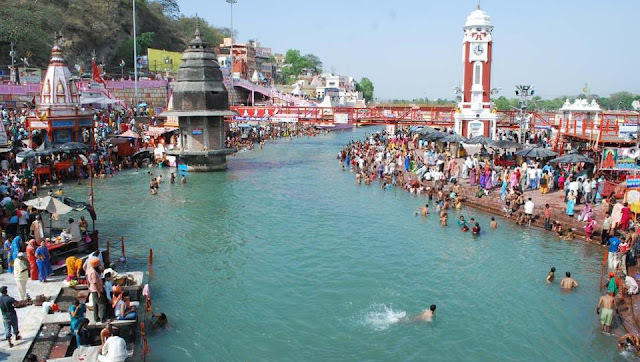 Prime Minister Mr Modi is known to have given high priority for Ganga and declared after winning the 2014 parliamentary elections that Mother Ganga has called me. Unfortunately, the state of Ganga has only worsened under this government, even more than earlier government, since it's business priority even for Ganga. So the high investment, but river destroying schemes like inter-linking of rivers (Ken Betwa, their top priority scheme is in the Ganga basin), big dams (world’s tallest ever dam, Pancheshwar is in Ganga basin), water ways (national waterways 1 is in Ganga basin and they are already doing massive, destructive dredging, river ports and so on, without any environment or social impact assessment or public consultation process), River Front Development, Big Sewage Treatment Plants and sew lines, to name some, are their priority. So four years into the government, they are still talking about “firm commitment”, while the state of the river has only gone worse, majorly due to their own actions and inactions. There is no mention of other rivers at all. The FM said in Para 13: “in our party’s manifesto it has been stated that the farmers should realize at least 50 per cent more than the cost of their produce, in other words, one and a half times of the cost of their production. Government have been very much sensitive to this resolutions and it has declared Minimum support price (MSP) for the majority of rabi crops at least at one and a half times the cost involved. Now, we have decided to implement this resolution as a principle for the rest of crops. I am pleased to announce that as per pre-determined principle, Government has decided to keep MSP for the all unannounced crops of kharif at least at one and half times of their production cost. I am confident that this historic decision will prove an important step towards doubling the income of our farmers.” The claim that this promise of at least 50% return on cost for farmers have been achieved for Rabi crops, is clearly wrong. Even the Economic Survey released three days back clearly says that real incomes of farmers has NOT increased in last four years and thus contradicts the FM’s claim. Secondly, four years into the government, the government still has no clue how they are going to achieve this objective for kharif or summer crop. FM also says in para 11: “Honourable Prime Minister gave a clarion call to double farmers’ income by 2022 when India celebrates its 75th year of independence.” While the economic survey has confirmed that real income of farmers has not increased in last four years, and this budget, the last one of this govt, has no credible steps to achieve that. So this government is going to leave farmers worse off than what they were, leave aside the question of doubling their income and if they go to voters saying give us a chance, we will do it by 2022, that wont have much credibility either. In fact the Economic Survey 2017 brings more bad news for farmers. It says: “A second key finding is that these impacts are significantly more adverse in unirrigated areas (and hence rainfed crops) compared to irrigated areas (and hence cereals). Applying these estimates to projected long-term weather patterns implies that climate change could reduce annual agricultural incomes in the range of 15 percent to 18 percent on average, and up to 20 percent to 25 percent for unirrigated areas.” (Ch 6, Vol 1, p 82) Now look at the Budget 2018 in this context and we find that the Budget has NOTHING to offer to farmers for these losses, and yet repeats its hollow promise of doubling the income! In fact the government even refuses to acknowledge that farmers are climate change victims, nor demand that farmers be compensated for the losses. The Budget has nothing to offer for environment (even its promise of scheme for incentivizing use of machines in Punjab, Haryana, UP and NCR in para 35 “A special Scheme will be implemented to support the efforts of the governments of Haryana, Punjab, Uttar Pradesh and the NCT of Delhi to address air pollution and to subsidize machinery required for in situ management of crop residue” is without substance), sustainable development, democratic governance, equity or participatory or transparent decision making. On the whole, the Budget ends up being lacklustre, neither populous, nor helping Ease of Doing anything particular. Not ever Ease of LEAVING? You decide that.